Hezbollah (pronounced /ˌhɛzbəˈlɑː/;Arabic: حزب الله‎ Ḥizbu 'llāh, literally "Party of Allah" or "Party of God")—also transliterated Hizbullah, Hizballah, etc.—is a Shi'a Islamist political party and militant group based in Lebanon. 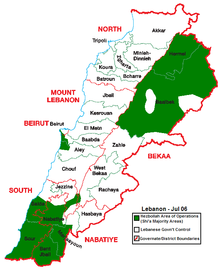 Hezbollah's paramilitary wing is the Jihad Council, and its political wing is Loyalty to the Resistance Bloc party in the Lebanese parliament. Since the death of Abbas al-Musawi in 1992, the group has been headed by Hassan Nasrallah, its Secretary-General. The group is considered a terrorist organization by the United States, Israel, Canada, the Arab League, the Gulf Cooperation Council, along with its military wing by the United Kingdom, Australia and the European Union. The ideology of Hezbollah has been summarized as[according to whom? ]Shi'i radicalism; Hezbollah follows the Islamic Shi'a theology developed by Iranian leader Ayatollah Ruhollah Khomeini. 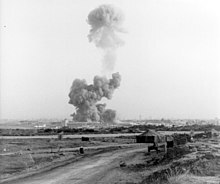 Hezbollah was largely formed with the aid of the Ayatollah Khomeini's followers in the early 1980s in order to spread Islamic revolution and follows a distinct version of Islamic Shi'a ideology (Valiyat al-faqih or Guardianship of the Islamic Jurists) developed by Ayatollah Ruhollah Khomeini, leader of the "Islamic Revolution" in Iran. Although Hezbollah originally aimed to transform Lebanon into a formal Faqihi Islamic republic, this goal has been abandoned in favor of a more inclusive approach. According to Israeli Minister Naftali Bennett, Hezbollah has around 130,000 rockets and missiles in place targeting Israel.Israeli Defense Forces Chief of Staff Gadi Eisenkot acknowledged that Hezbollah possesses "tens of thousands" of long- and short-range rockets, drones, advanced computer encryption capabilities, as well as advanced defense capabilities like the SA-6 anti-aircraft missile system. Hezbollah has long been an ally of the Ba'ath government of Syria, led by the Al-Assad family. Hezbollah has helped the Syrian government during the Syrian civil war in its fight against the Syrian opposition, which Hezbollah has described as a zionist plot to destroy its alliance with al-Assad against Israel.Geneive Abdo opined that Hezbollah's support for al-Assad in the Syrian war has "transformed" it from a group with "support among the Sunni for defeating Israel in a battle in 2006" into a "strictly Shia paramilitary force". The leaders of the March 14 alliance and other prominent Lebanese figures called on Hezbollah to end its involvement in Syria and said it is putting Lebanon at risk.Subhi al-Tufayli, Hezbollah's former leader, said "Hezbollah should not be defending the criminal regime that kills its own people and that has never fired a shot in defense of the Palestinians". He said "those Hezbollah fighters who are killing children and terrorizing people and destroying houses in Syria will go to hell". The Consultative Gathering, a group of Shia and Sunni leaders in Baalbek-Hermel, also called on Hezbollah not to "interfere" in Syria. They said, "Opening a front against the Syrian people and dragging Lebanon to war with the Syrian people is very dangerous and will have a negative impact on the relations between the two".Walid Jumblatt, leader of the Progressive Socialist Party, also called on Hezbollah to end its involvement and claimed that "Hezbollah is fighting inside Syria with orders from Iran". Egyptian President Mohamed Morsi condemned Hezbollah by saying, "We stand against Hezbollah in its aggression against the Syrian people. There is no space or place for Hezbollah in Syria". Support for Hezbollah among the Syrian public has weakened since the involvement of Hezbollah and Iran in propping up the Assad regime during the civil war. Hezbollah operations in South America began in the late 20th Century, centered around the Arab population which had moved there following the 1948 Arab-Iraeli War and the 1985 Lebanese Civil War. In 2002, Hezbollah was operating openly in Ciudad del Este. Beginning in 2008 the United States Drug Enforcement Agency began to work against Hezbollah activities in regards to Latin American drug trafficking. The investigation by the DEA found that Hezbollah made about a billion dollars a year and trafficked thousands of tons of cocaine into the United States. Another destination for cocaine trafficking done by Hezbollah are nations within the Gulf Cooperation Council. In 2013, Hezbollah was accused of infiltrating South America and having ties with Latin American drug cartels. One area of operations is in the region of the Triple Frontier, where Hezbollah has been alleged to be involved in the trafficking of cocaine; officials with the Lebanese embassy in Paraguay have worked to counter American allegations and extradition attempts. In 2016, it was alleged that money gained from drug sales was used to purchase weapons in Syria. In 2018, Infobae reported that Hezbollah was operating in Colombia under the name Organization of External Security. That same year, Argentine police made arrest to individuals alleged to be connected to Hezbollah's criminal activities within the nation. It is also alleged that Venezuela aids Hezbollah in its operations in the region. One particular form of involvement is money laundering. The United Nations Security Council never listed Hezbollah as a terrorist organization under its sanctions list although its members listed it on an individual basis: The United States and France listed the entire group as a terrorist organization although the United Kingdom listed Hezbollah's military wing as well.Russia has considered Hezbollah a legitimate sociopolitical organization, and the People's Republic of China remains neutral, and maintains contacts with Hezbollah. The United States,France, the Gulf Cooperation Council,Canada, the Netherlands, and Israel have classified Hezbollah as a terrorist organization. In early 2015, the US Director of National Intelligence removed Hezbollah from the list of "active terrorist threats" against the United States while Hezbollah remained designated as terrorist by the US, and by mid 2015 several Hezbollah officials were sanctioned by the US for their role in facilitating military activity in the ongoing Syrian Civil War. The European Union, New Zealand, the United Kingdom, and Australia have proscribed Hezbollah's military wing, but do not list Hezbollah as a whole as a terrorist organization. ^ a b c d Proscribed terrorist organisations (Report). Home Office. 27 March 2015. p. 10. Retrieved 6 July 2015. 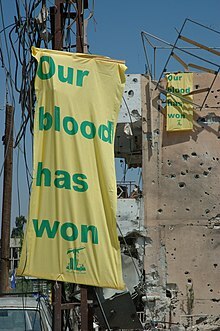 Hizballah's External Security Organisation was proscribed March 2001 and in 2008 the proscription was extended to Hizballah's Military apparatus including the Jihad Council. ^ Deeb, Lara (31 July 2006). "Hizballah: A Primer". Middle East Report. Retrieved 31 May 2011. ^ Adam Shatz, New York Review of Books, 29 April 2004 In Search of Hezbollah Archived 22 August 2006 at the Wayback Machine.. Retrieved 15 August 2006. ^ Thisreen (Syrian newspaper) 21 June 1999, reprinted by MEMRI Secretary General of Hizbullah Discusses the New Israeli Government and Hizbullah's Struggle Against Israel[unreliable source? ]Archived 30 September 2008 at the Wayback Machine.. Retrieved 30 July 2006. ^ "ADL Welcomes U.S. Designating Hezbollah's Al-Manar TV Station a Terrorist Organization: Calls On U.S. To Take Further Actions." Archived 11 August 2017 at the Wayback Machine. ADL. 2 February 2015. ^ " Hezbollah Releases Anti-Israel War Game." Archived 15 June 2010 at the Wayback Machine. ADL. 17 August 2007. 10 July 2010. ^ "Hezbollah: Hezbollah and the Recent Conflict." Archived 4 May 2007 at the Wayback Machine. ADL. 29 September 2006. 26 June 2007. ^ Gambill, Gary (September–October 2006). "Briefing: Lebanese Public Opinion". Mideast Monitor. Archived from the original on 27 September 2007. Retrieved 23 October 2012. ^ a b Cobban, Helena, "Hizbullah's New Face". Boston Review. April–May 2005. Archived from the original on 3 February 2007. Retrieved 2 February 2007. ^ Levin, Sandy. "Letter Urging European Union Council to Designate Hezbollah as a Terrorist Organization." Congressman Sandy Levin. 21 September 2012. 1 February 2015.